Available as an EPUB or MOBI here. When you travel through East Tennessee, you're bound to notice them: the barns and billboards with "SEE ROCK CITY" emblazoned in big white letters on the roof. It is one of the Chattanooga area's premier attractions, home to amazing rock formations, small caves, and a view from which you can supposedly see seven states. But within Rock City itself, you notice an abundance of gnomes, from the costumed mascot posing for pictures outside to the glow-in-the-dark statues inside the caves. But why does Rock City even have gnomes for mascots? The question has puzzled tourists and Chattanoogans for generations. Popular lore says Garnet and Frieda Carter designed the attraction with a fairy tale motif, with the gnomes as mascots for their Tom Thumb golf course. Many historians have repeated this story, never acknowledging the true role the gnomes played in the history of Lookout Mountain, Chattanooga, and America. 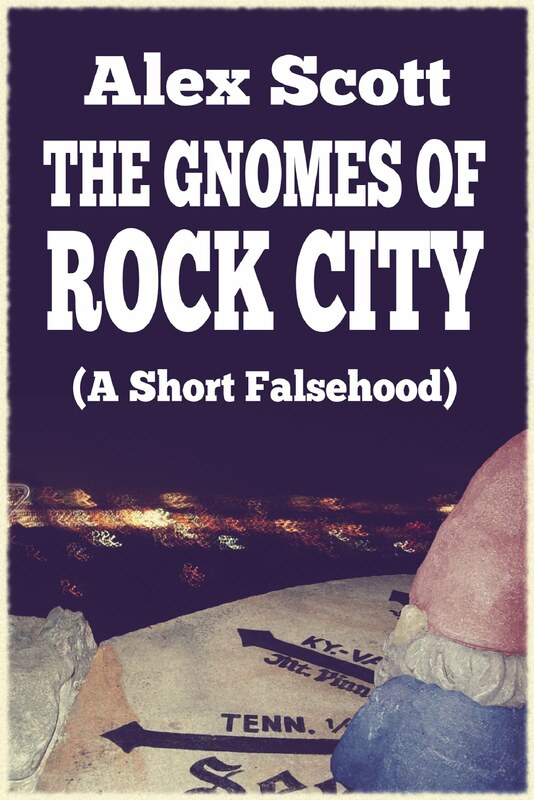 The gnomes are, in fact, the true founders of Rock City. They carved out the boulders and dug out the caves sometime in the 11th century. Records are spotty--Native American legends only rarely mention them—but the gnomes' own records indicate a constant presence in pre-Columbian history. They originally arrived in North America with the Vikings, then migrated south. When they settled in the Tennessee Valley, they occasionally clashed with the Nunnehi, the "Little People" of Cherokee lore, with whom the gnomes are sometimes confused. When John Ross set up the trading post that would become Chattanooga, it was the gnomes, led by Chief-Lord Mirg, who protected it from marauders, bears, wild bloorgs, and woodgreeps. Sadly, the persecution of the local tribes would affect the gnomes as well. The white man craved the gnomes' store of magic quartz in Cameron Hill, and the gnomes' charms and amulets were no match for muskets and rifles. When Andrew Jackson drove the Cherokee from the area, he also signed a specific order to eradicate the gnomes. Those who survived abandoned Rock City, and found refuge in the caves deep within Lookout Mountain. It was there that Ruby, the Priest-Princess of the gnomes, enchanted the underground waters to provide essential nutrients. Ruby Falls, named in her honor, is itself a tourist attraction to this day. The climax of human-gnome relations came during the Civil War. The gnomes knew quite well the nature of the conflict. When Chief-Lord Zor, son of Mirg, found the Confederate Army occupying Lookout Mountain, he was incensed. The language in the records is quite forceful and obscene. The Confederacy's defense of slavery reminded him too much of the beliefs that drove his people into the caves. He wasn't sure the Union was much better, but he saw the opportunity to lead his people into one last battle. Under Zor's orders, the Priest-Princes and the Priest-Princesses cast a spell on the Union soldiers, cloaking them in mist as they charged up the mountain. At the same time, Zor and General Idich attacked the fort at the top of the mountain, throwing the Confederate Army into disarray. After the Union's victory in the "Battle Above the Clouds," General Grant himself entered the caves of Ruby Falls to thank the gnomes. But there was no trace. The gnomes had vanished, leaving only their manuscripts, which meticulously recorded their legends and their history. These records are currently archived, and largely forgotten, at the Hamilton State University Library. To this day the gnomes' whereabouts are unknown. Stories about the gnomes spread far and wide throughout the nineteenth century, inspiring songs, political cartoons, and stories—most of which are now also forgotten. So years later, when the Carters purchased the ancient gnome homeland of Rock City, they set out to honor the gnomes' memory. They placed statues on the trails as reminders of the city's former inhabitants, and by opening the Tom Thumb course, they helped popularize the noble gnome sport of "Goo-Nii," which we roughly translate as "miniature golf." Now, as we pass through the tunnels of Rock City, we are called to reflect on the pivotal role the gnomes played in American history. If they ever return, let us greet them with a spirit of thanks and reconciliation. 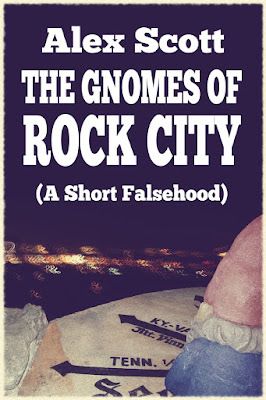 May Rock City be a gnome city once again!